Children under age 2 should not consume foods with added sugar. Children ages 2 to 18 should consume no more than 6 teaspoons of added sugar a day. Choosing healthy drinks is just as important as making good food choices. Many drinks have added sugar. When children consume drinks with sugar often throughout the day, their risk for developing tooth decay increases. This issue of Brush Up on Oral Health focuses on choosing healthy drinks and identifying drinks with added sugar. This issue also discusses what Head Start staff can do to help parents prevent tooth decay by promoting healthy drink choices (e.g., milk, fluoridated tap or bottled water) and limiting drinks with sugar. During a baby’s first year of life, breast milk is best. If an infant is not fed breast milk, the infant should be fed iron-fortified formula. The American Academy of Pediatrics recommends that children be fed whole milk until age 2, unless the child’s primary care provider recommends switching to reduced fat (1 percent) or non-fat (skim) milk sooner because of health reasons. Low-fat or non-fat milk and plain water, ideally fluoridated tap water, are healthy drink choices for children over age 2. Head Start staff can do many things to help parents prevent tooth decay by promoting healthy drink choices and encouraging parents to limit drinks with sugar. Encourage parents to give children plain water, ideally fluoridated tap water (see the April 2013 issue of Brush Up on Oral Health). If parents prefer to use bottled water, encourage them to check the label to see if the water contains fluoride. Parents can also check the International Bottled Water Association’s website for a list of bottled water brands that contain fluoride. Educate parents that children should not be put to sleep with a bottle or sippy cup containing drinks with natural or added sugar. If parents put the child to bed with a bottle or sippy cup, it should contain only water. Remind parents to give children ages 12 months and older no more than 4–6 ounces of 100 percent fruit juice per day. Encourage parents to give children frozen or fresh fruit that has been mashed or cut into bite size pieces instead of juice. If parents offer juice, tell them to serve it in a cup without a lid. Show parents The Drink Pyramid, an easy way to understand what drinks to give children and when. Give parents the handout to take home and keep in their kitchen. 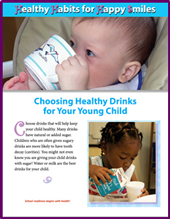 Share the English or Spanish version of the Healthy Habits for Happy Smiles handout Choosing Healthy Drinks for Your Young Child to reinforce messages about healthy drinks for children. Explain to parents that sugar-free drinks like diet pop or soda can harm teeth. The carbonation that makes these drinks bubbly can wear away the outer covering of teeth. This makes a tooth’s outer surface thinner and more likely to develop decay. 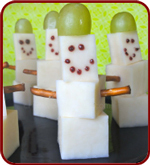 Here is a delicious healthy snack that children can make in a Head Start classroom or at home with their families. Break a pretzel stick in half and push each half into the sides of 1 cheese cube for arms. Put the blackberry preserves in a small plastic bag. Cut a small corner off the bag, and squeeze small dots of preserves to make a face. Build the snowman with 3 cheese cubes, and put a grape half on the top cube for a hat. Safety tip: An adult should slice ingredients and cut the bag. The National Center on Early Childhood Health and Wellness welcomes your feedback on this issue, as well as your suggestions for topics for future issues. Please forward your comments to health@ecetta.info or call 866-763-6481. Subscribe or view all issues of Brush Up on Oral Health on the Early Childhood Learning and Knowledge Center. This issue was developed with funds from grant #90HC0013 for the U.S. Department of Health and Human Services, Administration for Children and Families, Office of Head Start, Office of Child Care, and Health Resources and Services Administration, Maternal and Child Health Bureau by the National Center on Early Childhood Health and Wellness. This resource may be duplicated for noncommercial uses without permission. This publication is in the public domain, and no copyright can be claimed by persons or organizations. School readiness begins with health! Your child’s oral health plays an important role in their overall growth & development. In Head Start health services are based on the premise that a child must be healthy and ready to learn. Oral Health is essential to a child’s speech, language, and behavior. Head Start classroom’s practice and promote good oral hygiene daily, by helping children to brush their teeth with fluoridated toothpaste. The benefit of prevention and proper oral healthcare, along with the importance of establishing a dental home early in life are one of the many topics parents receive information on as well as gains a better understanding of oral health. According to the Academy of general Dentistry seeing a dentist twice a year during the school-year is vital because this is a time of great change in the mouth with kids losing baby teeth and getting in their permanent teeth. Tooth decay is the most common chronic childhood disease, and left untreated, it can impair a child's ability to eat, speak, sleep and learn. However, studies show more than 60 percent of school-age children do not see a dentist annually. "Simple preventive checkups twice a year can head off childhood decay and help you and your child learn how to protect their teeth through out the year." Children should brush at least twice a day. To encourage children to brush after every meal, let them pick out their own travel toothbrush and toothpaste. There are many child-friendly products that help encourage young children to brush. "Make sure your child's toothpaste contains fluoride and the toothbrush has soft-bristles."